The US mass market players are all seeking to create partnerships with start-ups and major players in e-commerce to catch up. Amazon has entered into an agreement with the Sears retail group to allow consumers to purchase tires online and have them installed at the distributor. This partnership is good for Amazon as it increases its business footprint in an industry where purchases are typically made in-person and in-store. For Sears, the interest is to bring customers into the store to sell other products when they come to put their tires. Similarly, Amazon is now working with Best Buy electronics stores to sell smart TVs. The brand will indeed market TVs that use the Amazon Fire TV system. The giant founded by Jeff Bezos has understood that customers have kept the habit of always buying certain products in physical outlets. This partnership will offer him a showcase at a lower cost. In another area, Macy’s has acquired STORY, a company that runs a concept store offering storytelling around the products presented. Macy’s wanted to hire an in-store experience specialist to improve the in-store offer for customers who are coming back to this shopping temple in New York City. The year 2019 should therefore be marked by this trend, which will not be confined to the American market. These partnerships will also expose these companies to new ideas and tactics. When a brand joins a start-up, it has more opportunities to be considered as an innovative company. According to a new Juniper Research report, chatbots will save retailers, banks and health care organizations $ 11 billion a year over the next five years. The results underscore the increasingly crucial role played by Artificial Intelligence-based voice or text assistants in the future of the industry – and in its present. The savings come from reducing the time companies spend on customer service – about 2.5 billion hours for all three industries by 2023. AI allows retailers to reduce their payroll (call center operators, for example). 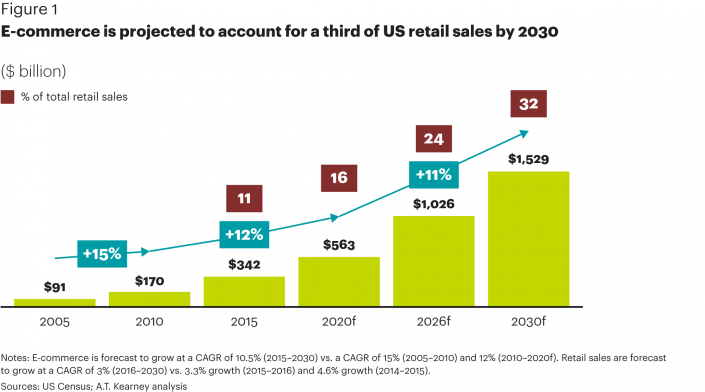 This report predicts that in 2023, more than 70% of chatbots will be based on retail. Merchants will always consider this technology as a way to save money and generate revenue. For retailers, one of the growth factors for chatbots will be the increased integration of technology in mobile sign applications. Chatbots allow them to achieve many goals. In addition to answering questions and helping customers find the products they are looking for, the use of chatbot is designed to persuade shoppers to spend more money, detect customers who drop their baskets, record the sale and convince them to sign up for loyalty programs. The study showed that for retailers, total annual transactions will be $ 112 billion per chatbot by 2023. With Taco Bell TacoBot, Slack users can order chalupas and nachos directly from the messaging platform. Starbucks gives consumers the ability to order beverages via the mobile application’s in-app chatbot via voice or text commands, and even alerts them when the order is ready. The Staples Chatbot , from a partnership with Watson, helps customers place an order or answer questions about orders already placed. In addition to Juniper, Gartner predicts a great future for chatbots, especially in retail. Gartner predicts that approximately 25 percent of customer service operations will integrate chatbot technology in just two years. One of the reasons is that humans quickly adopt the latter. According to a survey by Mastercard and Mercator , one in five American consumers have already made purchases using VCA (Virtual Customer Assistant) technology, and two-thirds have already used chatbots. Chatbots should continue their breakthrough in trade in 2019 and allow brands to accumulate personalized information about customers. Americans are increasingly interested in products, raw materials and a certain respect for the environment. Brands must therefore follow this trend. Similarly, ethical issues are becoming increasingly important in the current political climate. This year, there are many examples of brands’ commitment to the product and to customers to confirm that this trend will continue in 2019. The Buy-One Give-One model, popularized by Toms , Bombas and Yoobi , places social good and social impact at the heart of consumer concerns. Today, more and more brands are showing Generation Z (the new generation of consumers) that they care about bigger problems than their profits. Allbirds and Reformation are committed to creating sustainable clothing brands and Everlane promotes price transparency and plant safety. It’s not just the product that catches the attention of young consumers in 2018 but what it represents. This ethical shopping will have an even bigger impact on customers in 2019. The retail sector is booming and many experts agree that retail will change more by 2020 compared to the last 50 years. By 2020, it will not be only the Millennials that retailers will have to satisfy, but Generation Z will have power that impacts industry trends. In 2020, Generation Z customers will be the largest consumer group in the world. These new customers will have tools at their fingertips and will buy via digital tools like no previous generation. In addition, they will find the best prices and will also ensure that the retailer they support is socially conscious. 2019 will therefore be a year of considerable transition that will bring many changes in the attitudes of retailers to customers. Industry players must take into account new customer requirements as well as their own development needs. Partnerships will quickly acquire knowledge and experience. Communication with customers through chatbots and Artificial Intelligence will improve the quality of the models and therefore the quality of the offers. Finally, ethical shopping will bring a better brand image for the company and will become a major marketing asset. ← How Quickly has the Mobile Commerce Industry Changed?